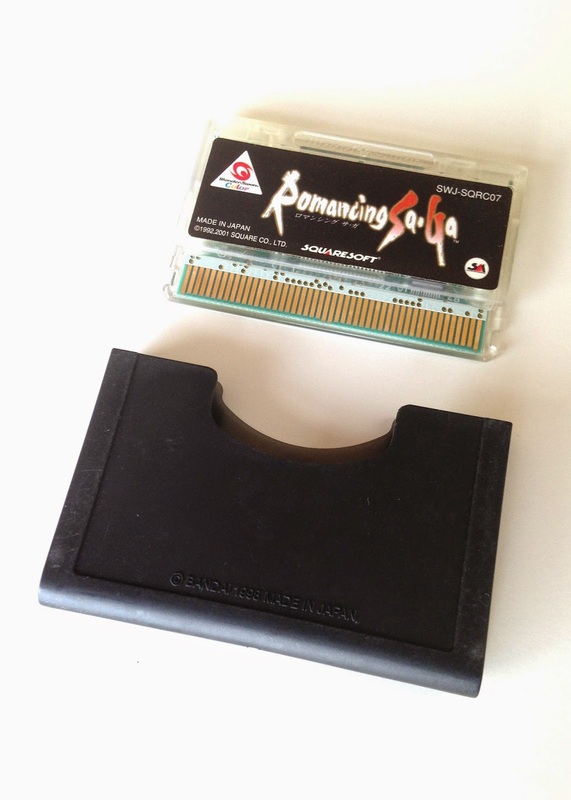 OK, so the “reasons” referred to in the header above are summed up by a handful of cartridge, manual and packaging photos rather than a bunch of words, but you can't have too many of the former, right? That’s especially true when the art attached and applied to the aforementioned packaging, manual and cart is as gorgeous as it is in the case of this impressive portable port of Squaresoft's oddball Super Famicom RPG. 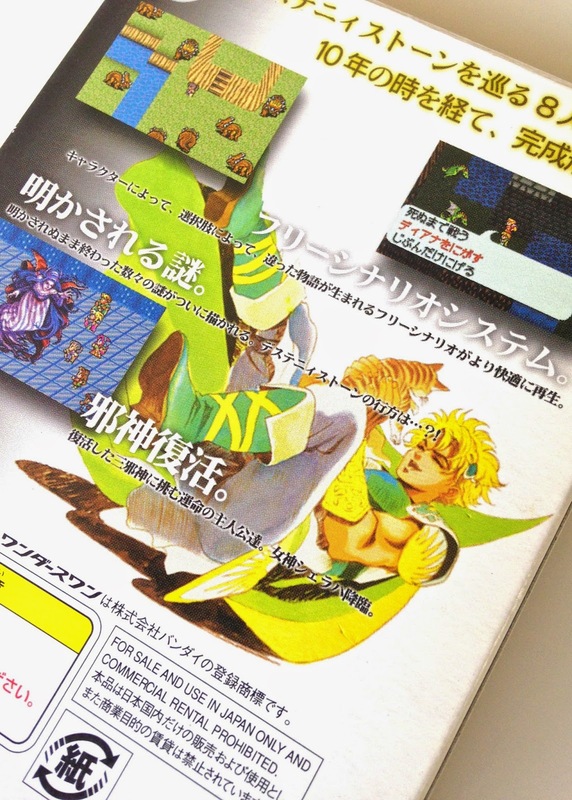 I mean, just look at the game's box art, for instance, which is showcased in the photo below. Doesn't it make you choke up a bit? At the very least, it should bring a hint of a smile to your face, what with its vibrant use of color, bold logo and striking character designs. Admittedly, Romancing SaGa's cart label, seen above, isn't anywhere near as thrilling, but who cares when every other aspect of this release is so spot-on? 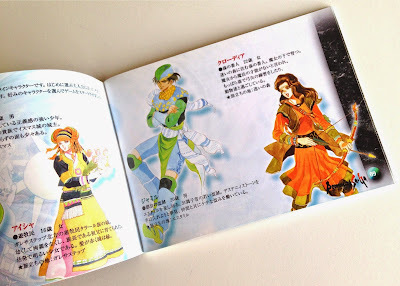 Another case in point: the game's instruction manual, which is crammed full of fabulous illustrations like the ones shown in the preceding snapshot. 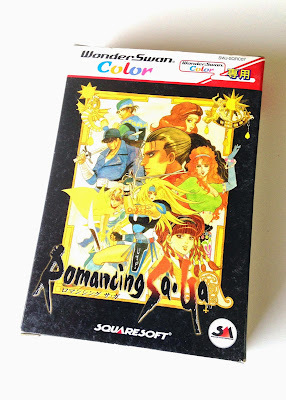 Another such illustration can be found on the back of Romancing SaGa's box, and it's the best of the bunch, if you ask me. Of course, how could it not be when it depicts one of the game's many party members horsing around with an adorable kitten? Sadly (but not unexpectedly), I've yet to put this cart through its paces. 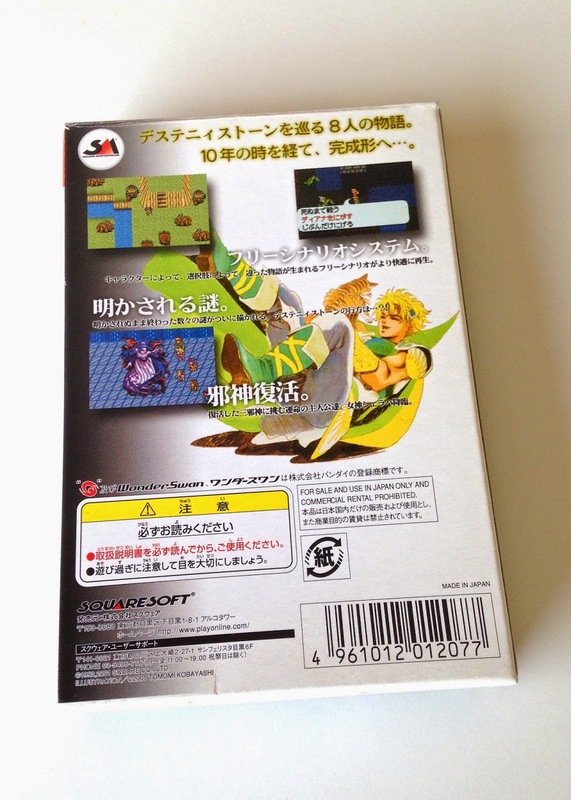 As soon as I get a WonderSwan Color or a SwanCrystal system, though, you can bet I'll do just that. And afterward, I'll write up some sort of report about the experience (which will be my first with any of Squaresoft's three 16-bit Romancing SaGa titles)--assuming its heavy use of kanji doesn't reduce me to tears. A cat! Cute! That's definitely my favorite of the illustrations, too. Great! I've always wanted to collect WS & games for it. I don't think I'll ever do it because of the hard to find nature of it. The logo is very striking. I suggest being emotionally prepared for tears. I source from anywhere I can. I generally like to touch and take in something I'm not familiar with first. The system and games are reasonably priced and I'll dip into it at some point. The visual pun had me giggling like a school boy. I can understand that. That said, I can't imagine you're going to find many places outside of Japan (or even within Japan, for that matter) where you can test drive a WS these days!